Here’s why you’ve got to love Fort Collins- last year there was a Dead Celebrity 5K, the week before Halloween, an easy out and back flat run from Old Town, to the Cemetery, and ending at the Rio Grande Restaurant, famous for their margaritas and their…well, just their margs, really. I ran it (slowly) dressed as Isadora Duncan (too soon?) and had fun, but resolved to recruit other people to run with me this year. Then we heard the news about Leonard Nimoy, and my husband said he would run it dressed as Spock, if I ran as Arlene Martell. 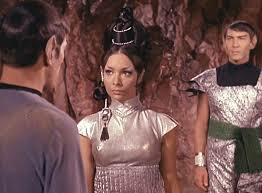 She played Spock’s fiancee in the Star Trek original series episode where Spock finds out his arranged marriage just isn’t going to work out. So I have been thinking about this costume for 6 months now, and then about a month ago, I realized I hadn’t gotten an email or anything from the race organizers, about registration. I looked it up, and there isn’t a dead celebrity race this year. I am beyond disappointed. Talk about all dressed up and no place to go. Of course I finished the costume anyway. 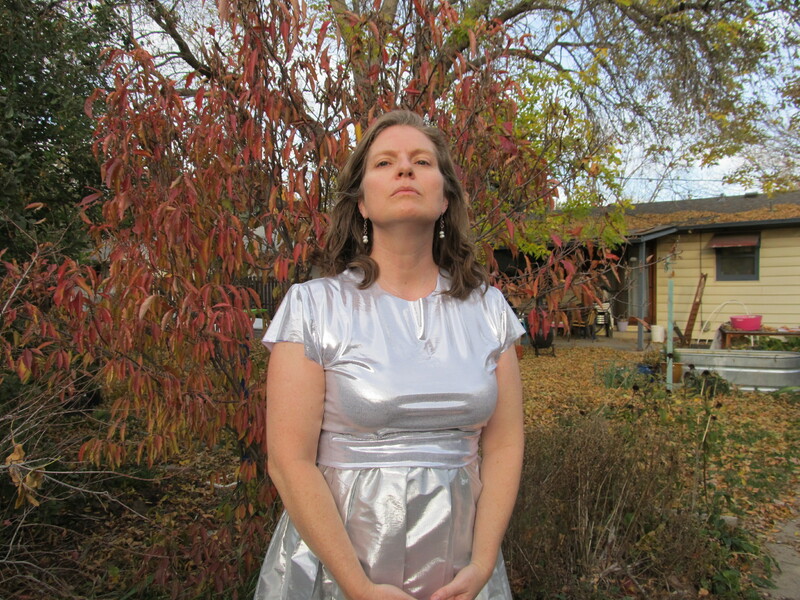 Or almost finished it- it isn’t Halloween yet… I still need to attach a Nehru style collar, and adjust the sleeves. Wait, what’s today? Maybe its fine as it is- also, what am I doing with my hair? I wanted to be able to run in it, so it is a silver knit tee, with a pleated skirt, which I can wear around my ribs, as in the show, or more comfortably around my waist. I used foldover elastic to make the waist, and since I used a metallic chiffon, which frays like crazy, I made French seams, which encloses the fraying edges inside a row of stitching. In hindsight, I wish I had bought more fabric- I cheaped out by only getting a yard, so the skirt isn’t as full as it could be. I used the tee pattern from the Alabama Stitch Book, but machine sewed it, rather than the hand sewing method from the book (have you become obsessed with Alabama Chanin yet? It is a wacky subculture of handmade clothing- love the aesthetic). I will figure out a place to wear this- Halloween is on a Saturday this year, so we’ll do something. Maybe it will involve a 5K run. Maybe it will involve a margarita. Maybe both? Will is signed up for orchestra this year, and since his piano teacher also teaches cello, we decided to get him time and a half lessons over the summer, because, what else was he going to do with his time? Go outside? Ha! So part of the lesson is piano, and part is cello, as he builds his callouses. Google didn’t help very much in terms of directions for how to make one. (what are we calling it? a cape? a bib? a protecto-quilt?) Maybe because it is pretty simple. I had material in my stash for it, but if you are starting from scratch, you would have 2 layers of fabric, with a layer of batting between, about 8-10 inches square. The layers of fabric with batting in the middle are what is known as a quilt sandwich- you could make 2 of these with a quarter yard of fabric, or look in the remnant bin for some purple velvet- that would look classy. We didn’t go classy, we went cute, with a bright blue and green print on one side and a paler blue solid on the back. I hand quilted, because I enjoy the process, but it can be done on the machine as well. I just made straight lines across diagonally, then bound it (link to directions ) The original plan was to have enough extra binding to stretch over and make a velcroed loop to attach it to the cello when needed, but you know how they say “measure twice, cut once”? Yeah. Anyway. I had to sew on extra for the loop. 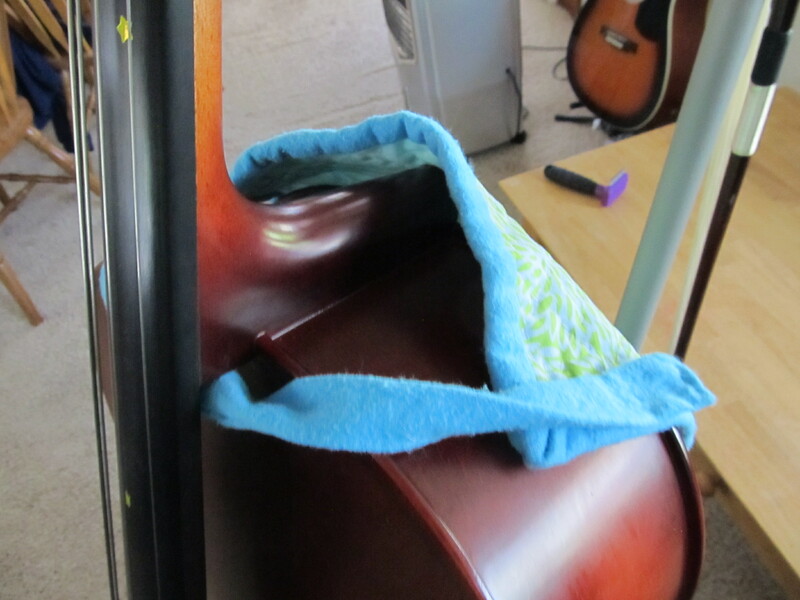 Now that I think about it, I don’t know why you couldn’t just get a hot pad from the dollar store, add a loop to go around the cello and use that as the cape. Bib. Protecto-quilt. Just until your baby develops the sternum callous. In Last Minute Quilted Gifts, there is this simple lovely idea- a quilt with dupioni silk on one side, rough muslin on the other, hand quilted with bright embroidery floss in big, rough stitches. 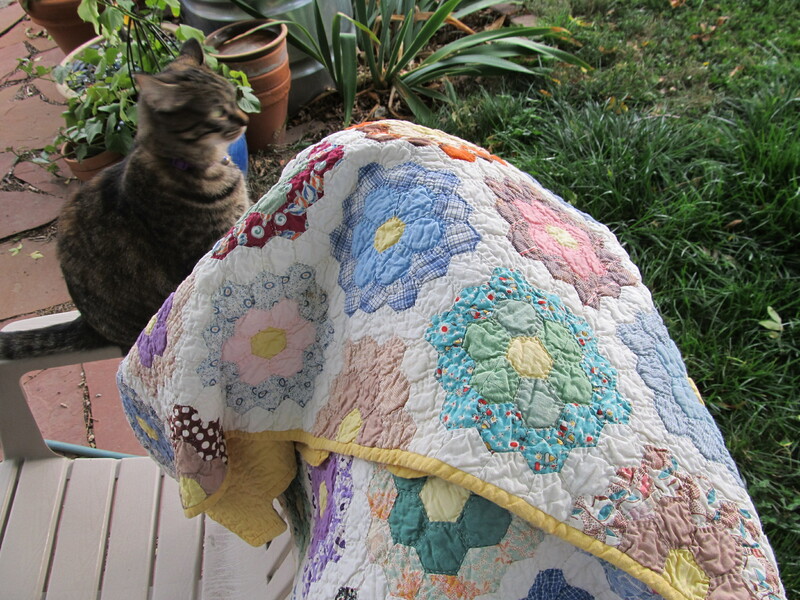 I haven’t been able to get that quilt out of my head, and I have designed a variation- rather than muslin, I wanted the fuzziness of fleece on the inside, and I decided to make it as a wrap, to drape around me watching TV, or fling on the back of the chair to look cool. 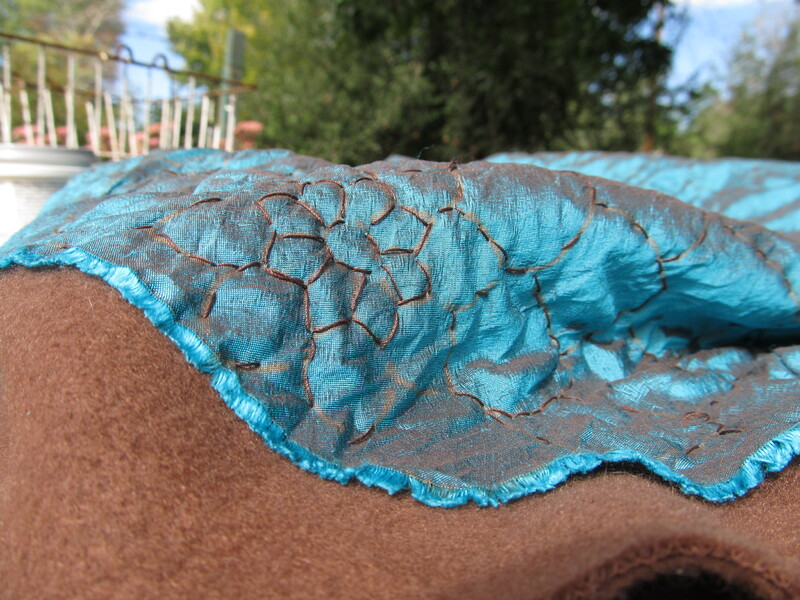 I found dark teal silk- it is woven one way with teal and the other direction with dark brown threads- there are natural slubs and rough spots in the silk. I got a yard, and cut it diagonally, then pieced it together to make a long parallelogram. I chose to fell the seam, since this fabric is really ravelly. Felling is folding the seam down, and stitching close to the original seam line. I love the contradiction in it- the silk contrasting with the fleece and the hand stitching. I used bronze sharpie to trace the stencil. I couldn’t face using chalk pencil and having it rub away. The sharpie ink will wash out someday, I’m not too worried. I picked brown fleece and brown thread to go with the brown warp threads. This quilting is very basic, sashiko style, with a running stitch following the design, which I repeated multiple times on the wrap. The work is slow- I’m not zipping through it fast with a machine, I’m just slowly following a line with a needle and thread. This will take me forever to finish, and that is fine with me. Sashiko was originally invented in Japan as a way of making utilitarian objects even more utilitarian- mending or patching garments, reinforcing the knees and elbows of work clothes to get a little bit more wear out of them. Karen Kim Matsunaga’s Japanese Country Quilting has great instructions and a bit of the history behind it. But here I am, buying silk, and cutting it up to make a quilt, when there are certainly utilitarian quilts out there in the world already. If I want something to snuggle under while I watch TV, why not use one of the fleece blankets we already own? What do you think, is this just another example of quilting madness, where people buy big pieces of fabric, cut them into little pieces, then sew them into big pieces again? That drives me crazy, so why am I doing it? Any insight is appreciated. The previous owners of our house finished the basement in idiosyncratic ways- for example, when they installed the basement shower, the drain holes didn’t line up. That’s bad. They also put in a storage system in the playroom with a sewing closet. Open the doors, and there is a desk with a rectangular cut-out for a sewing machine, and little drawers for scissors and bobbins and ribbons and things. That’s good. The result is that I can leave projects half finished and come back later, without having to clean off a table to sew. The bad thing is that it is in the basement, which is cold and dark in the winter. In summer, it is great, because when it gets unbearable upstairs in the afternoons, we can go down and play with legos and sew. In the winter, I don’t get much sewing done. But, today we have a project. 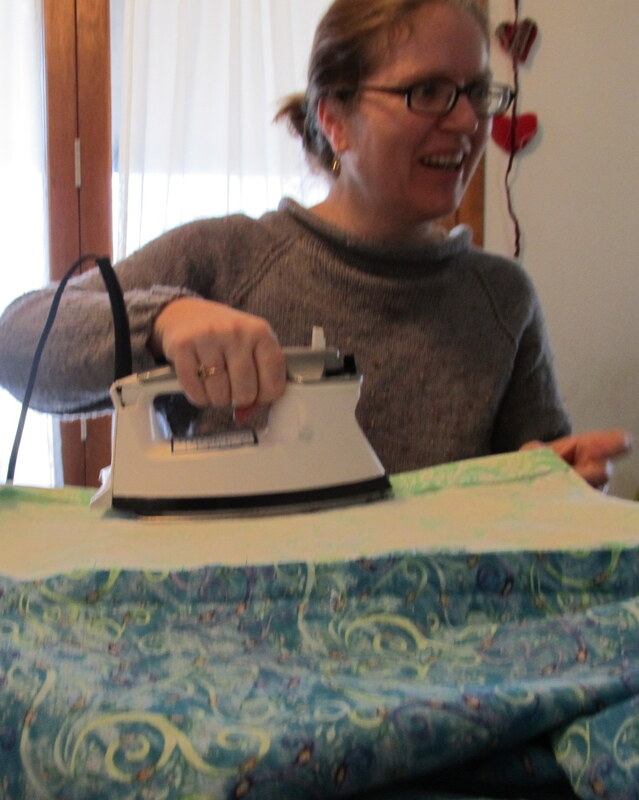 So, today, we’ve cleared off the dining room table, brought the sewing machine up, and the ironing board, and we are making some bedding for Kate. I mused to myself how I would be able to control my “control-freakiness” with Kate, and let her sew without hovering over her. It turns out, I am not having to, very much. I helped her wind bobbins, pinned some seams on pillowcases, let her sew…and then she kind of got bored. We had 6 long panels, 84 inches by 22 inches, so we sewed them together, then sewed across the top. Kate drifted off leaving me to zigzag the six long seams and press a hem in the opening. Thanks to my panel of experts, who advised me to leave a longer seam allowance, 1/2 inch rather than 1/4, and to zigzag the edges. Cut 25 inches off each fabric length. 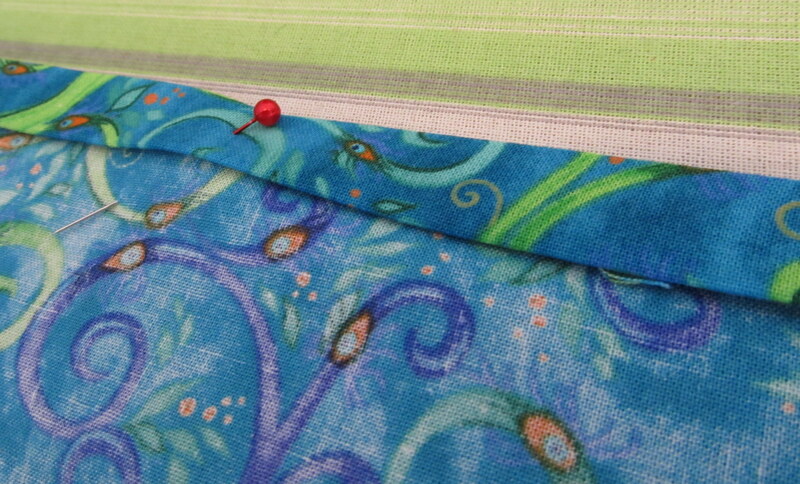 Choose one that will be the contrasting trim for both pillowcases and cut in half along its width. Set aside. Cut the selvedges off the long pieces of fabric, and rip them in half along their length. You will have 6 pieces that are 22 inches wide and 83 inches long. Working with two strips at a time, pin right sides together and sew together with a 1/2 inch seam allowance, then sew the pairs together to make one big tube. 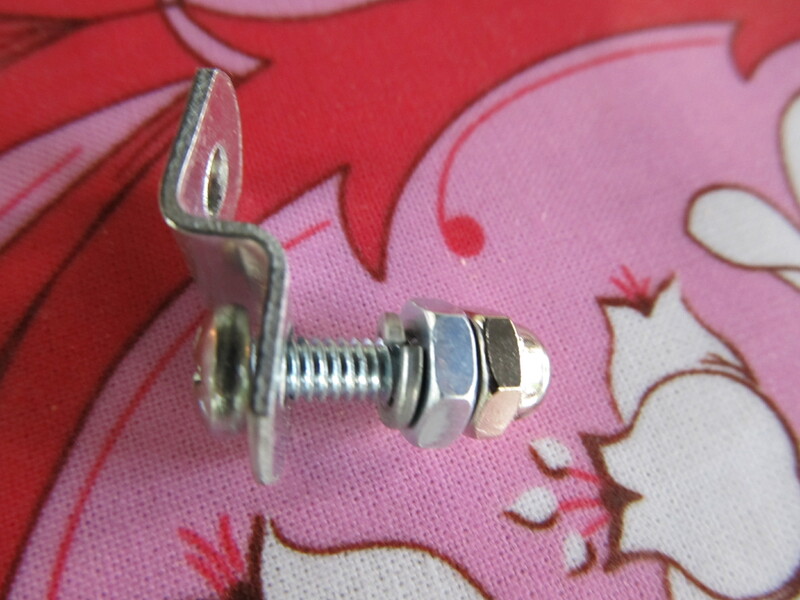 Pin the seam on the top of the cover, and sew it together. I lined up my seams at the edges, although as I type this, I realize I could have lined it up any which way, so the strips wouldn’t have the seams at the same place. Next time…And of course, you could make the strips any width. Take time to zigzag the seam allowances and press the allowances to the darker fabric. The open end is where you will feed the comforter in. I double-folded the hem and stitched it down, leaving the center open. This is where I should have put in snaps… and I probably will. For the pillowcases, sew the 12 inch long piece of accent fabric to the 25 inch long piece, along the width of the fabric, 38 inches. 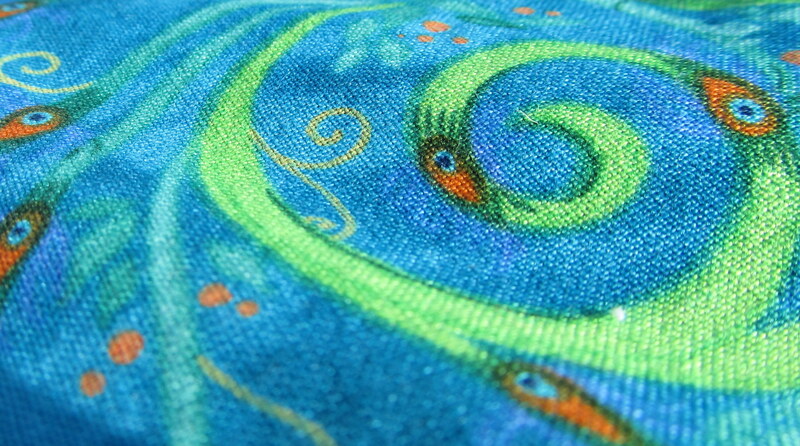 Press the seam toward the 12 inch side- it will be covered with the folded accent fabric. Fold and sew along the bottom and side. Press a half inch hem along the top of the accent fabric and topstitch down to cover the seam that attaches the two fabrics to each other. So we shopped at all the linens and baths and beyonds and things, (which I hate) and I wound up ordering one on Amazon (which I love). While waiting for it to arrive I started sketching ideas for duvet covers, thinking about embroidery, and patchwork, and scalloped edges. Now…this was before Christmas, the end of the quarter at my school, while Kate was sick and, even though I didn’t know it, I was about to catch the flu (at least I think it was the flu, I felt terrible, but I hope it makes me immune, because I still haven’t gotten a flu shot.) Seriously, it was a terrible time to start a giant quilty craft project. 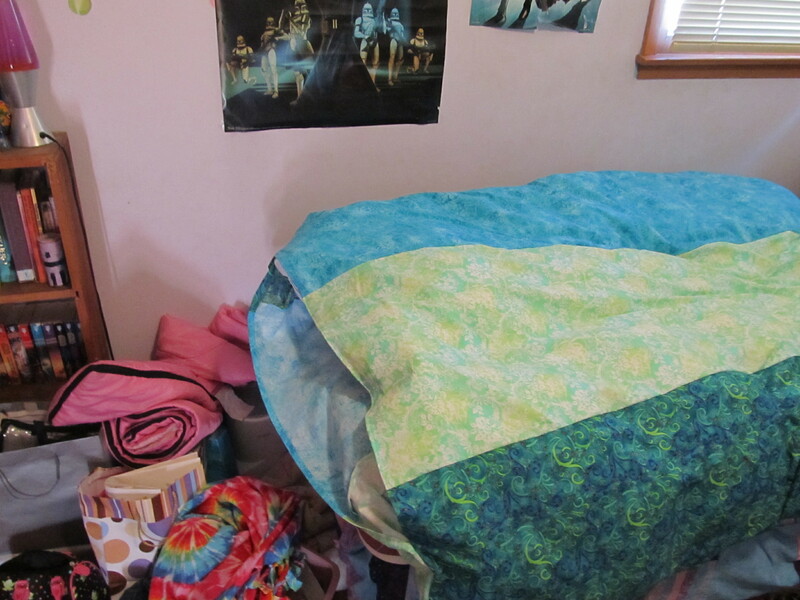 But I didn’t want to put the comforter on the bed just naked, it needed a cover. Now that Christmas is over, and the new quarter at school has started, and Kate is feeling better, and here’s hoping, that was the flu, not just a random virus and I won’t get sick, we went out and bought some fabric. The middle one is Kate’s favorite- it looks much better IRL- pale green with a swirly resist pattern. My favorite is the top one. We found inspiration in Last Minute Patchwork Gifts, by Joelle Hoverson, where I have found inspiration in the past. It was funny, as we flipped though it, Kate kept finding her quilt, and her brother’s, and one that I started for the guest room but still haven’t finished. It is a great beginner’s quilt book. We found one that was 2 bold fabrics, in vertical stripes and agreed to adapt it. 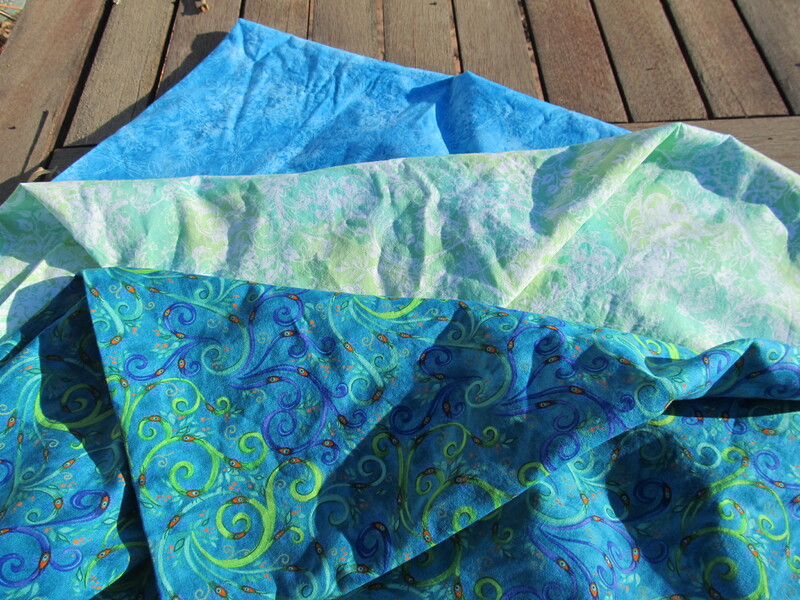 We hit the fabric store and Kate found three fabrics she really liked in blues and greens. Here’s another opportunity to work on my belief that the perfect is the enemy of the good, because I am going to let Kate sew, as much as she wants to. It will be 6 really long straight seams, and they don’t really have to be that straight, in the grand scheme of things. 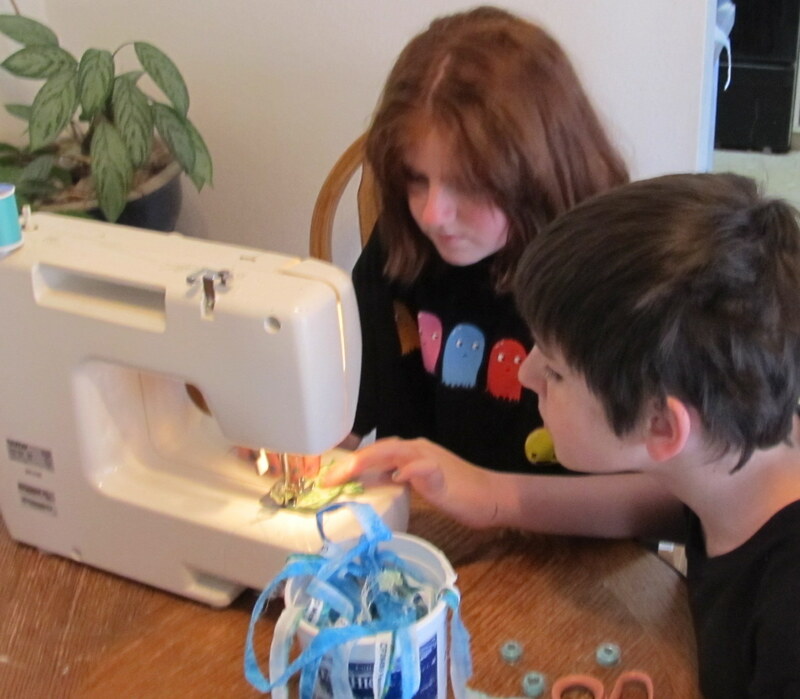 No school for Martin Luther King Day, so maybe we’ll bring the sewing machine up into the sunshine and work on it. 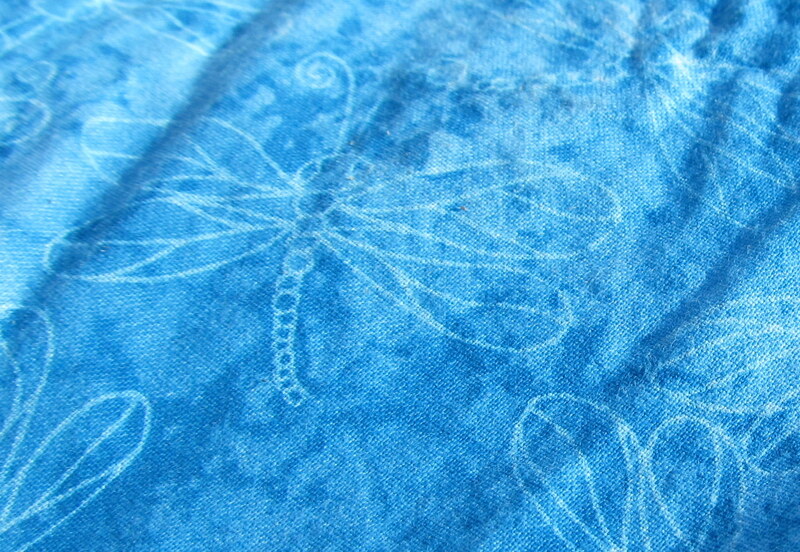 This almost reads as a solid, but there are little dragonflies up close. Love it. Watch for photos of progress. Here’s a question- as I understand it, you don’t finish the seams in a quilt with zig-zag or pinking shears because they will get quilted over, and aren’t likely to fray. With a duvet cover, should we zigzag? Quilty people? Are you there? When I went to my hometown for the weekend, my mom offered me a quilt made by her grandmother Neal. She cautioned me, “Now, back in those days, they just made things from scraps, it isn’t all fabrics that are matchy-matchy.” She said she had 2, and my sister had looked at them and told her to give me first choice. Pretty nice for just being made from scraps. I don’t have very many stories about my great- grandmother Neal- she lived on a farm in Kentucky and my mom would visit them for holidays and in the summer. She would always buy store-bought bread, so the children could eat sandwiches, but my grandmother was embarrassed by how many homemade biscuits my mom and uncles would eat. I imagine them at dinner, reaching for another biscuit, and my grandmother giving them that look that says, “I can’t believe you are reaching for another biscuit.” But then they eat it anyway. 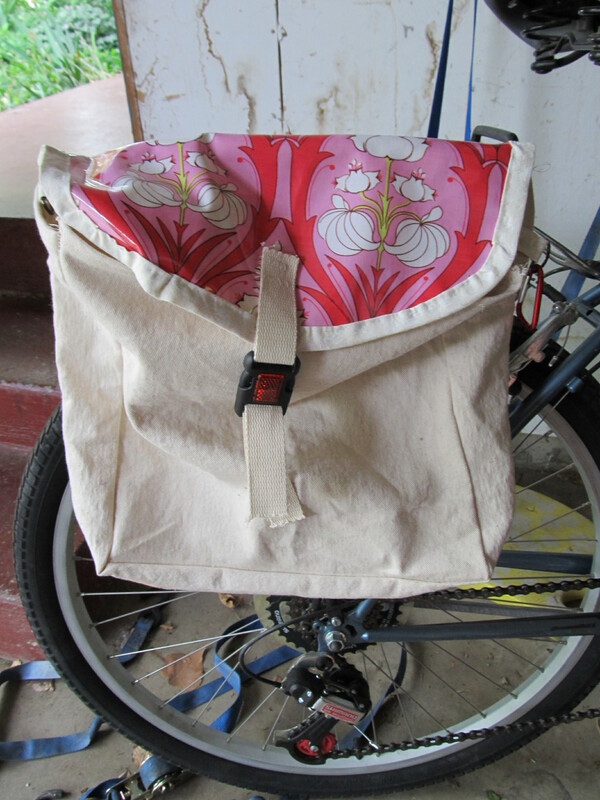 So, at home in the more recent past, mom climbed up on the step stool, and pulled out a zippered blanket bag. 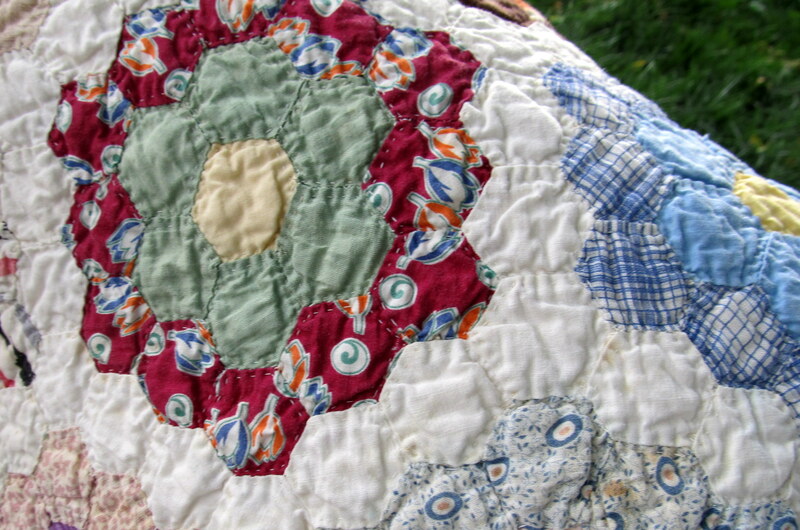 Wrong one- that one was little- a crib quilt made for my oldest brother by my paternal grandmother- amazing patchwork, and tiny hand quilting. My mom told me that she had made that one, then one for my second oldest brother, then was declared legally blind. No more quilting. The next bag that came out of the linen closet was the right one- it had two quilts made by my mom’s dad’s mom, Hattie Hill Hutchcraft Neal. The firstquilt to come out of the bag was a flower garden, hexagons in pastels and medium colors on a white field, with a scalloped border. The scalloped border was what sold me, Kate liked the hexagons. We laid it out on the recliner, and I looked closely at the tiny hand quilting. I’ve done some quilting and oh, my gosh, this woman knew what she was doing. If I were at all competitive I would quit, because, you know, I would be competing with someone born shortly after the time of the civil war. I can scraches ur quiltz? linen closet? Hang it up somewhere? Use it on a bed for the cat to tear up? I love that it is an antique (actually, what are the rules on linens? is it vintage? antique? where do you draw the line?) and I would like it to survive to become even antiquer (I know, not a word…) I have passed by two separate quilt racks at a thrift store- clutter-y and not really my style. But it is a shame not to have it where I can enjoy it. What are your thoughts?